From the perspective of biology, planetary engineering is the ability to alter the environment of a planet so that terrestrial organisms can survive and grow (McKay, 1982). The feasibility of altering planetary environments is clearly demonstrated by mankind's activities on the Earth (Levine, 1991; Fogg, 1995a) and it is increasingly apparent that in the near term future mankind will gain the technological capability to engineer the climate of Mars. Current thought experiments/proposals for the planetary engineering of Mars differ in their methodology, technical requirements, practicality, goals and environmental impact (reviewed and discussed by Fogg, 1995b). The planetary engineering of Mars may be divided into two distinct mechanistic steps, ecopoiesis followed by terraforming. Ecopoiesis, a term derived by Haynes (1990) which, when applied to Mars, can be viewed as the creation of a self-regulating anaerobic biosphere. On the other hand, terraforming refers to the creation of a human habitable climate (discussed in Fogg 1995b). Whether the creation of such biospheres are possible is not known (Fogg, 1989; Pollack and Sagan, 1993; Fogg, 1995b). However, the majority of these planetary engineering models invoke the use of biological organisms, both during alteration of the planetary environment and in the regulation of the resulting biosphere. This article will briefly review the implications of the current Martian environment and assets for biology and then discuss the relationship between biology and planetary engineering. At present the Martian surface environment is effectively sterilizing for all forms of terrestrial organisms (Rothschild, 1990; Mancinelli and Banin, 1995; Dose et al. 1995), although some protected niches may exist above and below the surface of Mars (Friedmann, 1986; Thomas and Schimel, 1991; Boston et al. 1992; Rothschild, 1990, 1995). The atmospheric pressure on Mars (Table 1), mostly due to carbon dioxide, varies from approximately 7.4 to 10 millibar (mbar) (Hess et al. 1980). Extremely low pressure damages organisms and can affect efficient DNA repair (Ito, 1991; Koike et al. 1991). The average diurnal temperature ranges from approximately 170 K to 268 K. During the Martian summer the temperature perhaps rises above the freezing point of water at some equatorial latitudes. First, the temperatures would completely freeze any organism and depending on the freezing process would cause cellular damage through the formation of ice crystals. Second, such low temperatures would raise the activation energy for enzyme catalyzed processes and thus inhibit biochemical/metabolic reactions. Third, biochemical reactions occur in solution and the transport of metabolites would not occur efficiently in a ice crystals. Liquid water which is a prerequisite for life (McKay, 1991; McKay and Stoker, 1989), under the current Martian atmospheric pressure is unstable. Such extreme dry conditions would cause dehydration, for example damaging DNA (Dose et al. 1995) and leading to mutation and cell/organism death. The main source of radiation at the Martian surface is ultraviolet (UV) radiation between the wavelengths of 190 and 300 nm. UV-radiation can be lethal. It is absorbed by nucleic acids (i.e. DNA) and activates the chemical formation of various adjuncts that inhibit replication and transcription of DNA. In the absence of an ozone layer, organisms can only escape the lethal affects of UV-radiation by living in protected habitats. Even those surface organisms which have efficient DNA and cellular repair enzymes would probably perish. Due to the continuous bombardment of the Martian surface with UV-radiation the topmost layer of the regolith is thought to contain strong oxidants which are damaging for cellular components. As mentioned previously the major atmospheric component is carbon dioxide (Table 1). In organisms the relatively high concentration of carbon dioxide would probably cause a low intracellular pH. i.e. acidosis which may be damaging for cellular proteins, cellular components and metabolism (Hiscox and Thomas, 1995). Because of the continuous bombardment of UV-radiation and oxidizing conditions, no organic material will be present on the Martian surface (Bullock et al. 1994 and references there in). Mars-atmospheric composition and partial pressure of the most abundant gases. (Data from Fogg 1995c, Hiscox 1995 and references therein). Undoubtedly the current Martian environment is extremely hostile for terrestrial life. However, Mars does contain sufficient volatiles to enable some form of colonization and perhaps planetary engineering to render environmental conditions more clement for terrestrial life to survive and grow (Meyer and McKay, 1984, 1989; McKay et al. 1991a; Fogg, 1995c; Zubrin, 1995). Analysis of Martian soil and shergottites, nakhlites and chassignittes (SNC) meteorites (believed to have been ejected from Mars - Mustard and Sunshine, 1995 and references therein) has shown that all of the elements necessary for carbon based life on Earth are present on Mars (Dreibus and Wanke, 1987; Gooding, 1992; Banin and Mancinelli, 1995). It is evident that Mars once possessed a more clement climate and many observable surface features have been attributed to the presence of liquid water and a dense carbon dioxide atmosphere (Carr, 1986; 1987). Many planetary engineering scenarios (see Fogg, 1995c and references there in) propose that it may be possible to return Mars to an earlier such climate using planetary engineering techniques (with the proviso that such volatiles are still present). Fogg (1995c) suggests that unless impact erosion (Melosh and Vickery, 1989) "blasted" the atmosphere into space then huge quantities of volatiles are still likely to reside on the planet. Over geological history Mars may have lost more volatiles than it gained. For example, water may also have been lost by hydrodynamic escape, atmospheric spluttering and other mechanisms (refer to Carr, 1987; Jakosky, 1991; Kass and Yung, 1995). Therefore returning Mars to a past climatic state may not be possible, and clearly given the climatic history of Mars such a climate maybe geologically unstable and undesirable for the extreme long term habitability of the planet. A number of compounds and elements are absolutely required for life; liquid water, the so called CHNOPS (carbon, hydrogen, nitrogen, oxygen, phosphorous and sulfur) are the main elements which constitute amino acids (which make up proteins) and nucleotides (which make up DNA and RNA) and various minerals are also required. All of these elements/compounds are believed to be present on Mars (Banin and Mancinelli, 1995). The amount and location of these resources on Mars is briefly reviewed below. For a more in depth reviews refer to Fogg (1995b,c); Meyer and McKay, 1989, 1991a; and Banin and Mancincelli (1995). Currently, the surface of Mars is devoid of liquid water and the atmosphere only contains minute amounts of water vapor (Table 1)(Carr, 1987). The two main sources of remaining water on Mars are thought to be the north polar cap and the regolith. The quantity of water on Mars is uncertain, and estimates range in order of magnitudes, equivalent to a layer of water over the planet 13 meters (m) to 100 m (Squyres and Carr, 1986). The north polar cap is composed mainly of water ice (Kieffer et al. 1976). The equatorial regions of Mars appear to be ice poor whereas the heavily cratered terrain pole-ward of ± 30° latitude appears to be ice rich (Squyres and Carr, 1986), with perhaps a conservative estimate of the equivalent of 17 m of ice spread over the surface of Mars (Jankowski and Squyres, 1993). How much liquid water would be necessary, or indeed liberated by either ecopoiesis and/or terraforming has not been determined. However, based on current data, a detailed model for the hydrological cycle on Mars has been proposed (Clifford, 1993) and perhaps this could be adapted for modeling the hydrological cycle during ecopoiesis/terraforming. Mars will probably never be a wet planet as it might have been in the past (Carr, 1986; 1987), although the view that Mars was "warm and wet" is uncertain and perhaps "cold and icy" may be more appropriate (Kasting, 1991; Squyres and Kasting, 1994). However, there will probably be sufficient water for some type of a biosphere to be established. For certain, the water requirement for ecopoiesis will be several orders of magnitude less than that for a terraformed biosphere. Ultimately, it may be possible to import water onto Mars, for example by the redirection of ice asteroids into the Martian atmosphere to release their volatile components (see Fogg, 1995b). However, although such proposition might be technically feasible, the number of asteroids needed to be diverted is very large. Bullock et al. (1994) estimate that organic material, either deposited by meteorites and/or remains from an earlier biosphere, maybe between 3 and 40 meters from the surface or perhaps be present in polar regions (Bada and McDonald, 1995). These deposits could therefore be utilized by plants that have long root systems and/or by subsurface microorganisms. However, such scenarios depend on how long it would take thermal waves to penetrate through the ground during planetary engineering. On first inspection the two main sources of "trapped" carbon dioxide are as a solid in the polar caps and adsorbed in the regolith. These sources are thought to exchange between 10 and 100 times the current atmospheric pressure of CO2 via the atmosphere and are thus thought to regulate climate change on Mars (Fanale et al. 1982). The permanent cap at the south pole is thought to contain at the most around 10 mbar of CO2 (Fanale and Cannon, 1979) (however this figure is uncertain). Due to the uncertainty in the extent of the Martian regolith, the total mineral surface area exposed to the Martian atmosphere is not known. However, laboratory simulations of the simultaneous adsorption of H2O and CO2 (Zent and Quinn, 1995), where palagonite is used as an analogue of the Martian regolith (Zent et al. 1987), would appear to confirm that the current absorbed inventory of CO2 is 30-40 mbar. An even greater source of CO2 may be combined in the form of carbonate. Carbonates would have been formed by CO2, present in the early Martian atmosphere, dissolving in water and combining with cations such as Ca2+, Fe2+ and Mg2+ and subsequent precipitates forming carbonates (refer to McKay and Nedell, 1988 and references there in). Warren (1987) suggests that the regolith's low Ca/Si ratio is due to the fact that Ca was removed from the regolith as calcium carbonate. Warren (1987) estimates that perhaps a global shell 20m thick would suffice to remove 1000 mbar of CO2 from the Martian atmosphere. Whether this amount of carbonate is present is not known. However, the layered deposits observed in the Valles Marineris (Nedell et al. 1987) (believed to be an ancient water system) are thought to be derived from the precipitation of 30 mbar of atmospheric CO2 as carbonate in lakes (McKay and Nedell, 1988). One of the main limiting factors for the growth of "Martian" organisms could be the low abundance of nitrogen (Table 1). No direct analysis of the nitrogen content on the surface of Mars has yet been conducted, the proportion of nitrogen in the Martian atmosphere is shown in Table 1. The abundance of nitrogen on the surface of Mars has been estimated from analysis of SNC data (for example Grady et al. 1995) and it would appear that there is proportionally less nitrogen on Mars than on the Earth (Banin and Mancinelli, 1995). Therefore, from the planetary engineer's perspective it is crucial that forth coming Mars missions investigate the abundance (and perhaps distribution) of nitrogen containing compounds. Minerals are also essential for biological process, for example as co-factors in enzyme catalyzed reactions and components of vitamins. All of the elements necessary to support terrestrial life are thought to be present on Mars, although as with the CHNOPS elements their concentration compared to Earth are either slightly higher, lower or the same (Banin and Mancinelli, 1995). Mineral deposits, carbonates and nitrates etc. may be located in ancient evaporate basins (Forsythe and Zimbelman, 1995) and given suitable locations, i.e. at equatorial latitudes (maximum surface temperature), low point (maximum atmospheric pressure), these may be ideal areas for establishing pioneer ecosystems. Indeed, locations where ancient Martian life may have flourished would contain subsurface organics that have been buried sufficiently deep enough to be protected from oxidation (Zent and McKay, 1994). However, as mentioned above, depending on their depth, these deposits may remain in deep freeze and thus inaccessible for a long periods of time. Locations for ancient Martian life include old oceans along northern planes (Helfer, 1990), ancient ice-covered lakes (Scott et al. 1991; Andersen et al. 1995) and evaporites (Rothschild, 1990). Therefore, site selection to establish these ecosystems may closely resemble site selection for Martian exobiology (Rothschild, 1990; Farmer et al. 1995). For Mars to be less hostile for pioneer organisms initial planetary engineering will be required to increase the atmospheric pressure. This will have a number of effects, including an increase in surface temperature, liquid water will be stable (at least at equatorial latitudes) and an increase in ozone abundance that will reduce the amount of UV-radiation reaching the surface. Perhaps the simplest way to do this, as discussed below, will be to liberate CO2 deposits using a runaway greenhouse mechanism. To initiate the runaway greenhouse mechanism for warming Mars, an initial warming is required to release CO2, this will act as a greenhouse gas increasing the global temperature leading to the release of more CO2 and so on (Haynes, 1990; McKay et al. 1991b; Zubrin and McKay, 1993). A number of mechanisms have been proposed to provide this initial warming step. Two techniques being orbiting mirrors to reflect sunlight onto polar regions acting alone or in conjunction with the in situ production of the greenhouse gases such as chlorofluorocarbons (CFCs) (McKay et al. 1991b; Zubrin and McKay, 1993). Estimates of the lifetime of CFCs in the Martian atmosphere vary from a few days (Levine, 1991-quoted in Fogg, 1992) to 100 years (Zubrin and McKay, 1993). Therefore, if the half-life of CFCs in the Martian atmosphere is small, the production of such quantities of CFCs to warm Mars may be impractical (Fogg, 1992). The Levine estimate of CFC lifetimes maybe an under estimate as this was based on a current Martian environment in which the O3 layer is very small and thus more UV-radiation is available to degrade the CFCs. If solar mirrors could be used to produce an increase in the pCO2 then a greater ozone layer would form (via the photo-dissociation of CO2) thus increasing the lifetime of the CFCs. However, as Fogg (1992) points out, such CFCs may not co-exist with an ozone layer in a planetary engineered atmosphere, as the photo-dissociation products of CFCs are thought to react with O3 and therefore reduce ozone coverage. As discussed below, ozone will be important in reducing the amount of UV radiation on the surface of Mars so that terrestrial organisms may exist unprotected on the surface. Instead of using CFCs as a greenhouse gas it maybe possible to use alternative greenhouse agents such as perfluorocarbons (see Fogg, 1995b). However, the toxicity of perfluorocarbons at the concentrations required for warming Mars would have to be determined. An alternative greenhouse gas for warming Mars could be ammonia (NH3) (Pollack and Sagan, 1991). Ammonia rich asteroids could be diverted towards the Martian atmosphere to release their quantity of NH3 (Pollack and Sagan, 1991; Zubrin and McKay, 1993). However, the probability of locating asteroids that are composed of 100% NH3 is unlikely. The composition of any comet is unlikely to contain more than 10% NH3, therefore the problem is again a matter of scale. Also, NH3 has been shown to be very photochemically unstable in primitive terrestrial atmospheres (which may resemble Martian planetary engineered environments) and NH3 life times are estimated to be from 10 (Kasting, 1982) to 40 years (Kuhn and Atreya, 1979). Therefore the economic cost of importing NH3 containing asteroids might be more than the in situ production of some type of halocarbon to produce an equivalent greenhouse warming. However, as discussed in section six, there maybe a biological solution to this problem. At a conservative estimate, perhaps only 500 mbar of CO2 is available for release using the runaway greenhouse mechanisms. Based on the work of Kasting (1989; 1991), this would result in a surface warming of approximately 240 K, perhaps bringing temperatures at the equator (during the Martian summer) above the freezing point of water. (Note: Kasting (1989) is based upon a model of the climate of early Earth and assumes a 0.8-bar N2 background atmosphere and a 30% reduction in stellar luminosity- the insulation on Mars is approximately 50% that of Earth). Pollack (1991) estimates that CO2 pressures on the order of several bars were required to raise the annually averaged temperature at low latitudes on an early Mars to values in excess of 273 K and this is also in agreement with the calculations of McKay et al. (1991b) for planetary engineering. Thus using the runaway greenhouse mechanisms of planetary engineering, the climate of Mars would probably be cold and icy rather than warm and wet. Alternatively, in concert with the previous techniques or alone, nanotechnology may be employed for planetary engineering (Morgan, 1994; Nussinov et al. 1994) . For example in the liberation of carbon dioxide from carbonate deposits (Nussinov et al. 1994). Great claims are made to the potential exponential growth of nano-robots (Freitas, 1983; Morgan, 1994). Morgan (1994) has suggested that nano-robots could contain structures similar to those found in biological organisms. In common with microorganisms, nano-robots may have a huge growth capacity, i.e. doubling time, which for some bacteria, growing under ideal conditions, can be as little as 20 minutes. Ideal growth conditions for nano-robots are therefore likely to resemble those found for microorganisms (see Figure 1.). However, conditions on Mars will not be ideal for grow of either microorganisms or nano-robots. Nutrients/substrates may vary in abundance, there may be competition for resources etc. Therefore, growth is likely to be linear rather than exponential (Figure 1). Also, unlike biotechnology, nanotechnology has not been demonstrated. Growth curves of "organisms" (either microorganisms or nano-robots) on Mars. (A) Is the lag phase in which the "organisms" are growing at a slow rate. In microorganisms this caused by the "turn on" of genes to make new proteins etc. If conditions are optimal, i.e. abundant substrate/nutrients, and remain optimal, then growth rate becomes exponential (E). However, if ecological climax is reached, e.g. the substrate pool becomes limiting, then the population crashes (D1). A far more likely scenario is that the initial number of "organisms" grows slowly (B) as the distribution of substrates will not be uniform. Eventually, the number of organisms "living" will equal the number of organisms "dying" (C). If the substrate becomes limiting or environmental conditions worsen (i.e. drop in temperature) then the number of organisms will drop (D2). As conditions become more favourable then growth resumes (A). For Mars, the ideal growth curve for any organism should follow (A to C or D2). This idea of keeping growth rates below climax has been rightly argued by Fogg (1995b). There are a number of mechanisms available for liberating the carbon dioxide "trapped" as carbonates, including cometary impact (Fogg, 1989 and references there in) and nuclear mining (Fogg, 1989; 1992; Pollack and Sagan, 1991). Such anthropogenic mechanisms of planetary engineering become attractive if there is insufficient volatile inventory for a runaway greenhouse mechanism. The environmental consequences of radioactive fall out associated with certain forms of nuclear mining could be quite severe (Haynes and McKay, 1992), leading perhaps to widespread mutation and death of organisms. Given an advanced technology (more than that required for ecopoiesis) it may be possible to release carbon dioxide in carbonate deposits by volcanic means. The thermal erosion of carbonates has been hypothesised as a mechanism for the recycling of carbon dioxide into the atmosphere of early Mars (Schaefer, 1993). One of the main functions of initial planetary engineering would be to increase the ozone layer thus providing shielding of organisms from UV-radiation (Hiscox and Lindner, 1996). Based on O3 estimates in a Precambrian atmosphere, the minimum ozone column being tolerable by unprotected bacteria would fall between 1x1018 and 4x1018 cm2 depending on the bacterial species being considered (Francois and Gerard, 1988). Fortuitously, oxygen is not required to generate an ozone layer, instead the photodissociation of CO2 might be used to generate sufficient ozone to provide an ozone layer (Hiscox and Lindner, 1996). Such a scenario may be self-regulating (Figure 2). Diagrammatic representation of an ozone "cycle" during planetary engineering. (Interactions at the poles are complex and thus for simplicity are not represented). Ozone is created by the photodissociation of carbon dioxide. Through vertical mixing this reaches the lower atmosphere where it is destroyed by water, which has been released from the regolith by heating either with solettas (Birch, 1992) and/or greenhouse gases (McKay et al. 1991b). If only a minimum ozone coverage is created by planetary engineering (sufficient to provide shielding against lethal UV-radiation for most organisms), on some occasions the ozone level may drop below a threshold level. Thus exposed organisms may be exposed to lethal levels of UV-radiation on Mars. Seasonal and latitudinal variations in dust and cloud opacities have induced as much as a 40% variation in ozone on a seasonal and latitudinal basis (Lindner, 1988). In addition, the asymmetry in dust and cloud opacities at late winter in each hemisphere could also cause a 10-20% hemispherical asymmetry in ozone (Lindner, 1988). Therefore a mechanism of preventing this drop in ozone would be preferable. The current dust concentration in the Martian atmosphere can induce a 10-50% increase in ozone abundances because photodissociation rates are greatly reduced by dust absorption (Lindner, 1988) and this phenomena has been observed in the polar regions of Mars, where dust absorbs or scatters to space most UV-radiation before it strikes the cap (Lindner, 1990). Therefore a planetary engineering mechanism that can create such a dust storm would be useful in providing additional protection to organisms by reducing the amount of UV-radiation reaching the surface. First by providing direct shielding against UV-radiation and second by inducing localised increases in the production of ozone, thus restoring an ozone layer. One mechanism to generate a global dust storm may be heating of the polar regions with space based sunlight reflectors (Zubrin and McKay, 1993) (abbreviated to SBR). Similar to what occurs on Mars at the moment, the asymmetric heating of one pole would cause a pressure differential i.e. wind, and this would carry dust. However, if the polar reserves of carbon dioxide and water are liberated early in planetary engineering then an alternative mechanism is required. Such a mechanism could be the heating of a near by dusty area on Mars by a SBR (Hiscox and Lindner, 1996). This may cause a localised dust storm which would provide local UV-radiation coverage by plugging the nearby ozone hole. Satellites could be used to monitor atmospheric ozone abundances and warn of impending ozone "holes". Different microbial species vary widely in their optimal temperatures for growth. The upper end of temperature range tolerated by any given species correlates well with the general thermal stability of that species' proteins. Microorganisms share with plants and animals the heat shock response, a transient synthesis of a set of "heat shock proteins" when exposed to a sudden rise in temperature above the growth optimum. These proteins appear to be unusually heat resistant and act to stabilise the heat sensitive proteins of the cell. However, beyond a certain temperature proteins will irreversibly denature and therefore enzymes (which are mostly composed of proteins) will become non-functional. Some bacteria can also exhibit cold shock, the killing of cells by rapid as opposed to slow cooling. For example, rapid cooling of Escherichia coli from 310 to 278 K will kill 90% of the cells. Early stages of planetary engineering will probably require psychrophilic forms, i.e. those that grow best at low temperatures (normally 288-293 K). In order to define a minimum temperature and humidity for pioneer microorganisms to grow during ecopoiesis one can study microorganisms that inhabit regions on the Earth that best approximate regions on Mars. Apart from the greater pressure and less UV-radiation, the cold dry Ross Desert regions of Antarctica best approximate Mars (Friedmann and Weed, 1987; McKay, 1993). Yet these regions are host to a variety of microorganisms which live just under the surface of rocks and these are called endolithic microorganisms (Friedmann, 1982). In these regions air temperatures range between 258 K and 273 K in the summer and may drop to near 213 K in the winter, with relative humidities ranging from 16 to 75 percent (Friedmann, 1982 and references there in). Before planetary engineering, Mars will be colder than Antarctica, however, as discussed above, using the greenhouse mechanism it may be possible to raise the surface temperature of Mars to conditions resembling Antartica. Microbial activity in the Antarctic cryptoendolithic habitat is regulated by temperature (Nienow et al. 1988a) and metabolic activity is possible only when solar radiation raises the temperature of the rock above 263 K (Nienow et al. 1988b). Therefore the minimum Martian surface temperature required for ecopoiesis, should 263 K or greater (at least in regions were organisms will be seeded). Cryptoendolithic lichens begin photosynthesis when the matric water potential is -46.4 megaPascals (MPa) which corresponds to a relative humidity of 70% at 281 K, whereas cryptoendolithic cyanobacteria photosynthesize at high matric water potentials of -6.9 (and greater) (a relative humidity of 90% at 281 K) (Palmer Jr. and Friedmann, 1990). Alternatively, both may use melt-water as a source of water rather than water vapour which is used in times of environmental stress. Therefore, if melt water is unavailable for pioneer microorganisms, the relative humidity should be at least 70%, perhaps lower if genetic engineering (see below) can be used to increase tolerance to desiccation. Alternatively, pioneer microorganisms could be adapted to tolerate desication (Friedmann, 1995-personal communication in Hiscox and Thomas, 1995), and this is perhaps a more feasible mechanism than genetic engineering. After the introduction of microorganisms into a partially altered Martian environment the growth rate will exceed the death rate and therefore there should be a net accumulation of microorganisms. However, once the new biosphere becomes established the population of microorganisms in a stable biosphere will be roughly constant, i.e. growth is balanced by death. The survival of any microbial group within its niche is determined in large part by successful competition for nutrients and by maintenance of a pool of living cells (or dormant cells) during nutritional deprivation. In a constantly changing environment, as will occur during planetary engineering, the proportion of living bacteria to dead bacteria may vary dramatically (Figure 1). A number of pioneer microorganisms and plants have been proposed for introduction onto a partially altered Mars (Averner and MacElroy, 1976; Friedmann and Ocampo-Friedmann, 1994; Hiscox, 1995; Hiscox and Thomas, 1995; Fogg, 1995d). The first organisms will of necessity be photoautotrophic (Haynes and McKay, 1992), which means that they utilise sunlight as an energy source and do not require complex organic material for metabolism (which would be absent on the surface of the planet prior to the introduction of terrestrial microorganisms-see section two). Schematic representation of selecting organisms for growth on Mars. Candidate organisms could perhaps be isolated from extremes of environments on the Earth that in some respects resemble the partially altered environment on Mars. The organisms could be further adapted to Mars by either genetic engineering and/or selection in Marsjars. Once environmental conditions become more clement on Mars, organisms could be directly introduced from the Earth with minimum adaptation. (The stage at which organisms could be introduced onto Mars is indicated by the right-hand path - Taken from Hiscox, 1996). Genetic engineering is now common place and the ability to manipulate organisms for Mars, especially prokaryotes and also eukaryotes is entirely feasible (Hiscox, 1995). For example, a pioneer microorganisms's tolerance to lower intracellular pH could be increased by engineering in a gene(s) from another organism that confers tolerance to low pH (Hiscox and Thomas, 1995). Such an organism would then be termed recombinant, or in this case a genetically engineered Mars organism (GEMO; Hiscox, 1995). One danger in introducing new genes into an organism is that the over expression of such a gene may lead to deficiencies in other key metabolites, therefore the inter-conversion of biosynthetic components has to be tightly regulated (Hiscox, 1995; Hiscox and Thomas, 1995). Alternatively, organisms could be adapted for growth on a partially altered Mars by growing them under simulated environmental conditions that increasingly resembles the climate on Mars at the proposed time of their introduction. In genetic terms, this process is called directed selection and is a well known Darwinian concept. In which adaptation results from the systematic relationships between genotype and phenotype and between phenotype and reproductive success in a given environment. There are limits to increases in both physiological and metabolic processes using selection, and thus genetic engineering could be used to increase some of these. Because of their fairly rapid generation time, microorganisms would best lead themselves to this type of adaptation. A number of studies have grown various terrestrial microorganisms under different combinations of Martian or extreme terrestrial/non-terrestrial environmental conditions (for example see: Ito, 1991; Koike et al. 1991; Moll and Vestal, 1992) and the growth on Mars of a blue-green algae has been modelled (Kuhn et al. 1979). It is certainly feasible to conduct Marsjar simulations using terrestrial microorganisms and such experiments would provide data for the growth of terrestrial organisms in Martian greenhouses and planetary protection issues. Indeed many of these types of experiments have already been proposed for planetary protection issues (Lindberg and Horneck, 1994). The only factor of a Martian environment that would be difficult to simulate is the effect of gravity. A fine balance between survival and evolutionary potential has to be struck by organisms that have the efficient ability to remove most errors in DNA replication. In general, an organism with perfect replication will never evolve, although genetic recombination (gene swapping) may still occur and act as a mechanism for evolution (and is perhaps the major driving force!). Whereas an organism with a highly error-prone mechanism would not survive. The error repair mechanism in bacteria is so accurate that an error is generated only once in 108 to 109 bases (a base is a unit of a chromosome). Because the genomes of bacteria are about 4.5 million bases long, only about 1% of the progeny have alterations in their base sequence. This error level can be easily tolerated, it also continuously generates variants that can be selected under specialized conditions. One must bear in mind that selection is always for survival, a given species has no advantage in evolving into a different species. Natural selection tends to promote the divergence of populations living in different environments. Radical changes in the habitat, as will occur during planetary engineering, will often exterminate a species, therefore organisms will have to be able to adapt to these changing circumstances. It is increasingly evident that many microorganisms exist in consortia formed by representatives of different genera. Other microorganisms often characterized as single cells in the laboratory form cohesive colonies in the natural environment. This property of organisms will be important during Marsjar simulations and subsequent introduction onto Mars. Almost certainly GEMOs/selected organisms will be released on the surface of Mars, either through contamination associated with manned exploration, colonist's greenhouses or the deliberate release during a planetary engineering effort. These organisms will be growing under conditions that do not occur on the Earth, and therefore their evolution may proceed in a completely novel manner compared to their counterparts on the Earth (Haynes, 1990). For example, non- pathogenic bacteria may become pathogenic. Such considerations are especially important if terraforming is realized and the human population will inhabit the surface of Mars, although many genetic safeguards can be built into such organisms (Hiscox, 1995). For example, microorganisms could be used to release carbon dioxide from carbonate deposits (Friedmann et al. 1993) and nitrogen from nitrate deposits (Thomas, 1995; Hiscox and Thomas, 1995) and appropriate deposits could be determined from orbit (Hiscox, 1995). In order to terraform Mars, McKay (1982) and McKay et al. (1991b) proposed that plants could be used to convert the mainly carbon dioxide atmosphere formed during ecopoiesis into an oxygen atmosphere. For example, Fogg (1992) estimates that 5.7x1017 kg of biomass would have to be sequestered as part of the biological production of 158 mbar of oxygen. Also, Fogg (1995d) has addressed some of the issues and suggests a number of solutions for growing plants in low oxygen concentrations that would be present during early stages of ecopoiesis i.e. below an oxygen pressure of 20 mbar. It should be noted that previous estimates of the time taken to convert a mainly carbon dioxide atmosphere into an oxygen atmosphere may be underestimates as these calculations did not take into account the possible increase in respiring aerobic organisms (i.e. lichen, bacteria etc.) that may concomitantly increase in numbers with more oxygen availability and result in the production of more carbon dioxide. Therefore, biology on Mars must be actively held away from ecological climax in order to maximize oxygen production and minimize its uptake (Fogg, 1995e). One should note that if plants are to be used to convert the mainly carbon dioxide atmosphere into an atmosphere suitable for human habitation, then in the early stages of this process all such plants should be either self or wind pollinating. Self pollination would probably be the preferred option as wind pollination may be extremely inefficient if the population density of plants is too low. These two mechanisms of pollination are required because the carbon dioxide atmosphere will be too toxic for insects that pollinate plants. Organisms will help maintain the gaseous composition of the Martian atmosphere and thus regulate climate. After planetary engineering, organisms such as plants will also affect climate by cycling vast amounts of water. An example is provided by Amazonia, which contains two-thirds of all above ground freshwater on Earth. At least half of Amazonia's moisture is retained within the forest ecosystem, being constantly transpired by plants before being precipitated back into the forest, with a mean cycling time of 5.5 days (Salati and Nobre, 1992). Sagan (1973; 1980) proposed that plant growth could be used to lower the albedo of the Martian polar caps thus increasing their absorption of solar radiation and heating them, thus hopefully triggering a runaway greenhouse effect. (This scenario has one main problem in that metabolic reactions do not occur at the temperatures found on the Martian polar caps). However, the idea does have great merit for stabilizing the albedo on Mars. For example Amazonia and Zaire forests stabilize the albedo on Earth (Gash and Shuttleworth, 1992). The Earth's biotas are pumps for the major bio-geochemical cycles (Schlesinger, 1991). From a longer term perspective, because Mars is believed to lack tectonic activity and therefore organisms such as microbes (Thomas, 1995) and plants (Fogg, 1995d) may play an essential role in the regulation of global nitrogen, carbon and other mineral cycles (McKay, 1982; Fogg; 1993; Thomas 1995). Whether purely biological cycles could replace bio-geochemical ones is a large problem facing "biological" planetary engineering (McKay, 1982; Fogg, 1995b; Thomas, 1995). Plants play a part in hydrological cycles in addition to those discussed in (i), by controlling water runoff. Vegetation permits a slower and more regulated run-off, allowing water supplies to make a steadier and more substantive contribution to their ecosystems, instead of quickly running off into streams and rivers- possibly resulting in flood and drought regimes downstream. As the hydrosphere is gradually activated on Mars so these hydrological cycle becomes more important. It will be important to ensure that water is cycled by transpiration and rainfall. Microorganisms could be used to metabolise nitrate deposits to NH3. As discussed in section four, NH3 is a powerful greenhouse gas, so not only would this process contribute to the warming of the planet, but at low levels NH3 would be photochemically broken down into N2, a further greenhouse gas (H2O) and H2 (Kasting, 1982). (However, this pathway maybe undesirable as the H2 produced would probably be lost to space (Fox, 1993 and references therein). Another green house gas that could be produced by biological mechanisms is methane, CH4. Methane may have been a constituent of the Martian paleoatmosphere (Kasting, 1991). However, methane is rapidly photodissociated by UV-radiation, but an increase in ozone and efficient/abundant production of CH4 by biological organisms may partially mitigate this problem and lead to a net accumulation of CH4. On early Earth reduced organic material formed by fixation of carbon dioxide and carbonates was ultimately utilized by other organisms scouring the debris of destroyed cells. Thus pioneer microorganisms and subsequent generations will provide a pyramid of biomass for successive generations of organisms. (During initial planetary engineering the Martian surface will rarely be refreshed by rainfall and will be unable to retain moisture. Therefore hardy microorganisms which were able to utilize water vapor could be used to build up a "top soil"). The spread and settlement of vegetation protects soil cover. On Earth soil erosion is a major problem in many areas of the world, for example, it leads to declines in soil fertility. Although no soil is present on Mars with the growth of appropriate microorganisms gradually a biomass will begin to build up and the planting of trees, grasses and long rooted plants could, as on Earth, could be used to prevent large scale erosion (Figure 4). Provided the relevant organisms can grow on Mars, these would include trees to provide wood for construction, food and medicines, antibiotics from fungi etc. 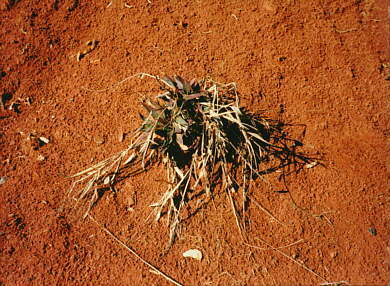 Photograph of plants on Mars. Once the oxygen level is around 20 mbar then plants can be introduced onto Mars. These will serve a number of functions including the production of more oxygen and stabilizing geological features. A drainage channel caused by the recent flow of water can be observed in the background. In the foreground plants are growing and spreading toward the drainage channel preventing further erosion. (Photograph J. A. Hiscox and M. W. Parnell). Also a key question is how many species are required to establish a stable ecosystem, either leading to Vitanova or Terranova? This concept is known as biodiversity and encompasses all life forms from the planetary species to populations of species together with their ecosystems and ecological processes. On Earth biodiversity plays two critical roles. Biodiversity provides the biosphere with a medium for energy and material flows, which in turn provide ecosystems with their functional properties. It supports and creates ecosystem resilience, which will be absolutely crucial on Mars. Resilience can be defined as the ability of ecosystems to resist stresses and shocks, to absorb disturbance and to recover from disruptive change. All of these processes will be occurring during planetary engineering and indeed occur on Earth. The concept can be expressed more formally, it connotes an equilibrium-theory idea to the effect that ecosystems with their cybernetic mechanisms display homeostatic attributes that allow them to maintain function in the face of stress induced structural changes (Cairns and Pratt, 1995). Biodiversity will be important during and after planetary engineering on Mars, one useful definition is of environmental/ecosystems services which reflect environmental functions and ecological processes and can be defined as any functional attributes of natural ecosystems that are demonstrably beneficial to mankind (Cairns and Pratt, 1995). Although, it is difficult to speculate on the composition of Martian ecosystems and to draw extrapolate from terrestrial ecosystems, on Earth the values provided by such systems include generating and maintaining soils, converting solar energy into plant tissue, sustaining hydrological cycles, running bio-geochemical cycles (including the elements carbon, nitrogen, phosphorus and sulphur), controlling the gaseous mixture of the atmosphere (which helps to determine climate - i.e. through the CO2/H2O greenhouse effect) and regulating weather and climate at both macro and micro-levels. Thus they basically include three forms of processing, namely of minerals, energy and water (Perrings, 1987). Ecological services at first inspection often depend to appear not so much on biodiversity but on biomass. For example, when a patch of forest is replaced by a monoculture, the new vegetation can supply certain of the same ecological functions (and perhaps more efficiently), including photosynthesis, protection of soil cover, atmospheric processing and hydrological functions. However, on closer inspection biodiversity is extremely important, a monoculture may provide less cycling of nutrients and other soil nutrients and be more prone to disease. During planetary engineering geological features will change, for example if the global temperature raises above 273 K then water in the form of ice will gradually begin to melt in the regolith. This has a number of consequences, for example, if rivers begin to form, the associated erosion may bring to the surface any buried organic material. Another important point to emphasize is that biology on Mars, at least during the initial stages of planetary engineering must always be used to add CO2/O2/N2 /greenhouse gases to the atmosphere. It would be undesirable to reach a point where microorganisms initiate a global freezing because all of the CO2 has been re-sequestered as organic carbon. The introduction of terrestrial microorganisms into the Martian environment, whether in greenhouses or for planetary engineering will obviously affect the search for any extinct, but especially extant Martian life. Before planetary engineering commences and during the initial stages the very surface of Mars will be sterilizing for all forms of terrestrial life, whether genetically modified/adapted or not. However, if oasis of life do exist, then such enclaves may be over run by terrestrial organisms. Or perhaps if environmental conditions become more clement during planetary engineering such organisms will compete with terrestrial organisms. Therefore, a thorough search for "life" on Mars will perhaps be necessary before the wide spread introduction of terrestrial organisms. For the "biological engine" to facilitate any planetary engineering effort certain environmental conditions discussed in section two will have to modified by non-biological means before organisms can be introduced. Most importantly a decrease in UV radiation and an increase in surface temperature above the freezing point of water. As discussed in section four, these conditions could both be accomplished by an increase in the atmospheric pressure. Undoubtedly the biological engine is very powerful, witness the conversion of the anaerobic environment on the early Earth to an aerobic biosphere via photosynthesis, a biological mechanism. Although, as Thomas (1995) points out, concrete data in the area of the biological engine is lacking and comparisons with terrestrial equivalents may be difficult to draw. Such predictions as to the effectiveness of a biological engine on Mars are hampered by four main factors; the composition, state and distribution of the volatile inventory and the performance of organisms under Martian conditions (Haynes, 1990). The forth coming Mars Pathfinder and Surveyor missions may provide some answers to the former three points and Marsjar simulations to the later. Colonists and planetary engineering are very interrelated. The presence of colonists on the Martian surface has been proposed to be the main driving force behind the ultimate terraforming of Mars (Fogg, 1993). In order to become less dependent on supplies from Earth, such colonies are likely to utilize greenhouses for a number of purposes including food production and waste processing/recycling. Such greenhouses could be viewed as giant Marsjars as the atmosphere inside the vessels might, in part, resemble the atmosphere at some point during planetary engineering, such as the Terrariums proposed by the Obayashi Corporation (Ishikawa et al. 1990; 1993). For example, the spread of organisms throughout the Martian soil, biomass production and plant growth e.g. respiration versus photosynthesis in a high CO2 environment could be simulated and modeled. The composition of a planetary engineered atmosphere has not been modeled in detail and colonist's greenhouses would probably contain more water than would be liberated by near term planetary engineering scenarios. One point to note is that H2O2 release by the Martian "top soil" may be toxic for organisms in the greenhouse (Zent and McKay, 1994). To overcome this problem efficient venting may be used, at least until the H2O2 production decreases to more tolerable levels. Alternatively, deeper soil deposits that do not contain oxides (Bullock et al. 1995) could be used. Colonists/explorers will be best able to assess the volatile inventory and distribution of materials essential for planetary engineering on Mars (Haynes, 1990; Haynes and McKay, 1992; Fogg, 1995c) and Antarctic research outposts may provide a useful model for this process (Andersen et al. 1990). Almost certainly, given near term technology, some form of ecopoiesis can be accomplished on Mars and Haynes (1990) suggested such a planet may be named Vitanova. Terraforming is more dependent on sufficient volatile inventory and is thus more uncertain than ecopoiesis. However, if terraforming is possible, i.e. to create Terranova (Haynes, 1990), then one of the main biological problems to be faced may be the environmental change from an anaerobic to an aerobic biosphere. On the early Earth a stepwise improvement in anaerobic metabolism allowed cells to survive and multiply wherever they could find simple nutrients in solution. A similar process may occur during ecopoiesis. However, after several billion years on the early Earth, the accumulation of free oxygen in the atmosphere brought about a radical change in the biosphere. The anaerobes retreated to unaerated environments and newly evolved aerobes took over the surface. Bacteria that could survive the toxic effects of oxygen could also capitalize on the more efficient metabolism it supported. This luxury may not be afforded to organisms that have prospered during ecopoiesis. McKay et al. (1991b) calculated an oxygen biosphere may be obtained in 21,000 to 100,000 years via photosynthesis. This is considerably less time than the switch from an anaerobic to an aerobic biosphere in the history of the Earth. Therefore, anaerobic organisms may perish and ecosystems and the biosphere disrupted. The remains of these organisms may provide biomass for the organisms that remain or those that are to come. However, the consequences and benefits of such a decision to proceed with terraforming Vitanova must be carefully weighed with the risk of failure (Haynes, 1990). In conclusion, in full agreement with McKay (1982), Haynes (1990) and Fogg (1995d) the relationship between biology and the planetary engineering of Mars can only be more accurately investigated when the volatile inventory, chemical state and geological distribution is determined. Also, extensive analysis of the performance of GEMOs and terrestrial microorganisms using Marsjars will be required. However, given the suitable abundance of such volatiles and moderate advances in technology, there is no biological reason why the goal of at least Vitanova cannot be realized. 1. Andersen, D. T., C. P. McKay, R. A. Wharton Jr. and J. D. Rummel. 1990. An Antarctic research outpost as a model for planetary exploration. Journal of the British Interplanetary Society 43, 499-504. 2. Andersen, D. T., P. Doran, D. Bolshiyanov, J. Rice, V. Galchenko, N. Cherych, R. A. Wharton, C.P. McKay, M. Meyer and V. Garshnek. 1995. A preliminary comparison of two perennially ice-covered lakes in Antarctica: Analogs of past Martian lacustrine environments. Advances in Space Research 15, 199-202. 3. Averner, M, M. and R. D. MacElroy. 1976. On the habitability of Mars: An approach to planetary ecosynthesis. NASA SP-414. 4. Bada, J. L. and G. D. McDonald. 1995. Amino acid racemization on Mars: Implications for the preservation of biomolecules from an extinct Martian biota. Icarus 114, 139-143. 5. Banin, A. and R. L. Mancinelli. 1995. Life on Mars? 1. The chemical environment. Advances in Space Research 15, 163-170. 6. Birch, P. 1992. Terraforming Mars quickly. Journal of the British Interplanetary Society 45, 331-340. 7. Boston, P. J., M. V. Ivanov and C. P. McKay. 1992. On the possibility of chemosynthetic ecosystems in subsurface habitats on Mars. Icarus 95, 300-308. 8. Bullock, M. A., C. R. Stoker, C. P. McKay and A. P. Zent. 1994. A coupled-soil-atmosphere model of H2O2 on Mars. Icarus 107, 142-154. 9. Cairns, J. and J. R. Pratt. 1995. 63-76. In Evaluating and monitoring the health of large-scale ecosystems. (Eds D. J. Rapport, C. L. Gaudet and P. Calow. Springer, Berlin. 10. Carr, M. H. 1986. Mars: A water rich planet? Icarus 68, 1887-216. 11. Carr, M. H. 1987. Water on Mars. Nature 326, 30-35. 12. Clifford, S. M. 1993. A model for the hydrologic and climatic behaviosr of water on Mars. Journal of Geophysical Research 98, 10973-11016. 13. Dose, K., C. Stridde, R. Dillmann, S. Risi and A. Bieger-Dose. 1995. Biochemical constraints for survival under Martian conditions. Advances in Space Research 15, 203-210. 14. Dreibus, G. and H. Wanke. 1987. Volatiles on Earth and Mars: A comparison. Icarus 71, 225-240. 15. Fanale, F. P., and W. A. Cannon. 1979. Mars carbon dioxide adsorption and capillary condensation on clays: Significance for volatile storage and atmospheric history. Journal of Geophysical Research 84, 8404. 16. Fanale, F. P., J. R. Salvail, W. B. Banerdt and R. S. Saunders. 1982. Mars: The regolith-atmosphere-cap system and climate change. Icarus 50, 381-407. 17. Farmer, J., D. Des Marais, R. Greeley, R. Landheim and H. Klien. 1995. Site selection for Mars exobiology. Advances in Space Research 15, 157-162. 18. Fogg, M. J. 1989. The creation of an artificial dense Martian atmosphere: A major obstacle to the terraforming of Mars. Journal of the British Interplanetary Society 42, 577-582. 19. Fogg, M. J. 1992. A synergic approach to terraforming Mars. Journal of the British Interplanetary Society 45, 577-582. 20. Fogg, M. J. 1993. Dynamics of a terraformed Martian biosphere. Journal of the British Interplanetary Society 46, 293-304. 21. Fogg, M. J. 1995a. Terraforming: A review for environmentalists. The Terraforming Report 2, No.2., 92-111. 22. Fogg, M. J. 1995b. Terraforming: Engineering Planetary Environments. SAE International, Warrendale, PA.
23. Fogg, M. J. 1995c. Exploration of the future habitability of Mars. Journal of the British Interplanetary Society 48, 301-310. 24. Fogg, M. J. 1995d. Terraforming Mars: Conceptual solutions to the problem of plant growth in low concentrations of oxygen. Journal of the British Interplanetary Society 48, 427-434. 25. Fogg, M. J. 1995e. Personal communication. 26. Forsythe, R. D., and J. R. Zimbelman. 1995. A case for ancient evaporite basins on Mars. Journal of Geophysical Research 100, 5553-5563. 27. Fox, J. L. 1993. On the escape of oxygen and hydrogen from Mars. Geophysical Research Letters 20, 1847-1850. 28. Francois, L. M., and J. C. Gerard. 1988. Ozone, climate and biospheric environment in the ancient oxygen-poor atmosphere. Planetary Space Science 36, 1391-1414. 29. Friedmann, E. I. 1982. Endolithic microorganisms in the cold Antarctic desert. Science 215, 1045-1053. 30. Friedmann, E. I. 1986. The Antarctic cold desert and the search for traces of life on Mars. Advances in Space Research 6, 265-268. 31. Friedmann, E. I. and R. Weed. 1987. Microbial trace-fossil formation, biogenous, and abiotic weathering in the Antarctic cold desert. Science 236, 703-705. 32. Friedmann, E. I. and R. Ocampo-Friedmann. 1994. A primitive cyanobacterium as pioneer microorganism for terraforming Mars. Advances in Space Research 15, 243-246. 33. Friedmann, E. I., M. Hua and R. Ocampo-Friedmann. 1993. Terraforming Mars: Dissolution of carbonate rocks by cyanobacterium. Journal of the British Interplanetary Society 46, 291-292. 34. Frietas, R. A. 1983. Terraforming Mars and Venus using self-replicating machines. Journal of the British Interplanetary Society 36, 139-142. 35. Gash, J. H. C. and W. J. Shuttleworth. 1992. 123-124. In Tropical forests and climate. (Ed. N. Myers). Kluwer Academic, Dordrecht, The Netherlands. 36. Gooding, J. L. 1992. Soil mineralogy and chemistry on Mars: Possible clues from salts and clays in SNC meteorites. Icarus 99, 28-41. 37. Grady, M. M., I. P. Wright and C. T. Pillinger. 1995. A search for nitrates in Martian meteorites. Journal of Geophysical Research 100, 5449-5455. 38. Haynes, R. H. 1990. Ethics and planetary engineering. 1. Ecce ecopoiesis: Playing God on Mars. In D. Macniven (Ed). Moral Expertise, 161-183. Routledge, London and New York. 39. Haynes, R. H., and C. P. McKay. 1992. The implantation of life on Mars: Feasibility and motivation. Advances in Space Research 12, 133-140. 40. Helfer, H. L. 1990. Of Martian atmospheres, oceans and fossils. Icarus 87, 228-235. 41. Hess, S. L., J. A. Ryan, J. E. Tillman, R. M. Henry and C. B. Leovy. 1980. The annual cycle of pressure on Mars measured by Viking Landers 1 and 2. Geophysical Research Letters 7, 197-200. 42. Hiscox, J. A. 1995. Modification of microorganisms for Mars. The Terraforming Report 2, 136-150. 43. Hiscox, J. A. 1996. Planetary engineering: The Science of genesis. Science Spectra. In press. 44. Hiscox, J. A. and D. J. Thomas. 1995. Modification and selection of microorganisms for growth on Mars. Journal of the British Interplanetary Society 48, 419-426. 45. Hiscox, J. A. and B. L. Lindner. 1996. Ozone considerations and the habitability of Mars. Manuscript in preparation. 46. Ishikawa, Y., T. Ohkita and Y. Amemiya. 1990. Mars habitation 2057. Concept design of a Mars settlement in the year 2057. Journal of the British Interplanetary Society 43, 505-512. 47. Ishikawa, Y., O. Gwynne, Y. Yamamoto, and H. Uyeda. 1993. Construction method and procedure for early-phase Mars base. The Case for Mars V.
48. Ito, T. 1991. The effects of vacuum-UV radiation (50-190 nm) on microorganisms and DNA. Advances in Space Research 12, 249-253. 49. Jakosky, B. M. 1991. Mars volatile evolution: Evidence from stable isotopes. Icarus 94, 14-31. 50. Jankowski, D. G. and S. E. Squryes. 1993. "Softened" Impact craters on Mars: Implications for ground ice and the structure of the Martian megaregolith. Icarus 106, 365-379. 51. Kass, D. M. and Y. L. Yung. 1995. Loss of atmosphere from Mars due to solar wind-induced spluttering. Science 268, 697-699. 52. Kasting, J. F. 1982. Stability of ammonia in the primitive terrestrial atmosphere. Journal of Geophysical Research 87, 3091-3098. 53. Kasting, J. F. 1989. Long-term stability of the Earth's climate. Palaeogeography, Palaeoclimatology, Palaeoecology 75, 83-95. 54. Kasting, J. F. 1991. CO2 condensation and the climate of early Mars. Icarus 94, 1-13. 55. Kieffer, H. H., S. C. Chase, T. Z. Martin, E. D. Minor and F. D. Palluconi. 1976. Martian north pole summer temperatures: Dirty water ice. Science 194, 1341. 56. Koike, J., T. Oshima, K. A. Koike, H. Taguchi, R. Tanaka, K. Nishimura and M. Miyaji. 1991. Survival rates of some terrestrial microorganisms under simulated space conditions. Advances in Space Research 12, 271-274. 57. Kuhn, W. R. and S. K. Atreya. 1979. Ammonia photolysis and the greenhouse effect in the primordial atmosphere of the Earth. Icarus 37, 207-213. 58. Kuhn, W. R., S. R. Rogers and R. D. MacElroy. 1979. The response of selected terrestrial organisms to the Martian environment. Icarus 37, 336-346. 59. Levine, J. S. 1991. Terraforming Earth and Mars. Mars: Past, present, and future: Proceedings of the Conference, Wiliamsburg, VA, 17-26. 60. Lindberg, C. and G. Horneck. 1994. Planetary protection considerations for Marsnet and Mars sample return missions. Advances in Space Research 15, 277-280. 61. Lindner, B. L. 1988. Ozone on Mars: The effects of clouds an airborne dust. Planetary Space Science 36, 125-144. 62. Lindner, B. L. 1990. The Martian polar cap: Radiative effects of ozone, clouds and airborne dust. Journal of Geophysical Research 95, 1367-1379. 63. Mancinelli, R. L. and A. Banin. 1995. Life on Mars? 2. Physical restrictions. Advances in Space Research 15, 171-176. 64. McKay, C. P. 1982. Terraforming Mars. Journal of the British Interplanetary Society 35, 427-433. 65. McKay, C. P. 1991. Urey prize lecture: planetary evolution and the origin of life. Icarus 91, 93-100. 66. McKay, C. P. 1993. Relevance of Antarctic microbial ecosystems to exobiology. Antarctic Microbiology, 593-601. Wiley-Liss Inc.
67. McKay, C. P. and S. S. Nedell. 1988. Are there carbonate deposits in the Valles Marineris, Mars? Icarus 73, 142-148. 68. McKay, C. P. and C. Stoker. 1989. The early environment and its evolution on Mars: Implications for life. Reviews of Geophysics 27, 189-214. 69. McKay, C. P., T. R. Meyer, P. J. Boston, M. Nelson, T. Maccallum and O. Gwynne. 1991a. Resources of near-Earth space. (Eds J. Lewis, M. Matthews and M. L. Guerrieri). University of Arizona Press. 70. McKay, C. P., O. B. Toon and J. F. Kasting. 1991b. Making Mars habitable. Nature 352, 489-496. 71. Melosh, H. J. and A. M. Vickery. 1989. Impact erosion of the primordial atmosphere of Mars. Science 338, 487-489. 72. Meyer, T. R. and C. P. McKay. 1984. The atmosphere of Mars-resources for the exploration and settlement of Mars. The Case for Mars. (Ed. P. J. Boston). American Astronautical Society Science and Technology Series 57, 209-232. 73. Meyer, T. R. and C. P. McKay. 1989. The resources of Mars for human settlement. Journal of the British Interplanetary Society 42, 147-160. 74. Moll, D. M. and J. R. Vestal. 1992. Survival of microorganisms in smectitie clays: Implications for Martian exobiology. Icarus 98, 233-239. 75. Morgan, C. R. 1994. Terraforming with nanotechnology. Journal of the British Interplanetary Society 47, 311-318. 76. Mustard, J. F. and J. M. Sunshine. 1995. Seeing through the dust. Martian crustal heterogeneity and links to the SNC meteorites. Science 267, 1623-1625. 77. Nedell, S. S., S. W. Squyres and D. W. Andersen. 1987. Origin and evolution of the layered deposits in the Valles Marineris, Mars. Icarus 70, 409-441. 78. Nienow, J. A., C. P. McKay and E. I. Friedmann. 1988a. The cryptoendolithic microbial environment in the Ross Desert of Antarctica: Light in the photosynthetically active region. Microbial Ecology 16, 271-2289. 79. Nienow, J. A., C. P. McKay and E. I. Friedmann. 1988b. The cryptoendolithic microbial environment in the Ross Desert of Antarctica: Mathematical models of the thermal regime. Microbial Ecology 16, 253-270. 80. Nussinov, M. D., S. V. Lysenko and V. V. Patrikeev. 1994. Terraforming of Mars through terrestrial microorganisms and nanotechnological devices. Journal of the British Interplanetary Society 47, 319-320. 81. Palmer, Jr., R. J. and E. I. Friedmann. 1990. Water relations and photosynthesis in the cryptoendolithic microbial habitat of hot and cold deserts. Microbial Ecology 19, 111-118. 83. Pollack, J. B. 1991. Kuiper Prize Lecture: present and past climates of the terrestrial planets. Icarus 91, 173-198. 84. Pollack, J. B., and C. Sagan. 1991. Planetary Engineering. (Eds J. Lewis, M. Matthews and M. L. Guerrieri). In Resources of Near Earth Space. University of Arizona Press. 85. Rothschild, L. J. 1990. Earth analogs for Martian life. Microbes in evaporites, a new model system for life on Mars. Icarus 88, 246. 86. Rothschild, L. J. 1995. A "cryptic" microbial mat: A new model ecosystem for extant life on Mars. Advances in Space Research 15, 223-228. 87. Sagan, C. 1973. Planetary engineering on Mars. Icarus 20, 513-514. 88. Sagan, C. 1980. Cosmos. Random House, New York. 89. Salati, E. and C. A. Nobre. 1992. 177-196. In Tropical forests and climate. Ed. N. Myers. Kluwer Academic, Dordrecht, The Netherlands. 90. Schaefer, M. W. 1993. Volcanic recycling of carbonates on Mars. Geophysical Research Letters 20, 827-830. 91. Schlesinger, W. H. 1991. Biogeochemistry: An analysis of global change. Academic Press, San Diego. 92. Scot, D. H., J. W. Rice, Jr. and J. M. Dohm. 1991. Martian paleolakes and waterways: Exobiological implications. Origins of Life and Evolution of the Biosphere 21, 189-198. 93. Squyres, S. W. and M. H. Carr. 1986. Geomorphic evidence for the distribution of ground ice on Mars. Science 231, 249-252. 94. Squyres, S. W. and J. F. Kasting. 1994. Early Mars: How warm and how wet? Science 265, 744-749. 95. Thomas, D. J. 1995. Biological aspects of the ecopoiesis and terraforming of Mars: Current perspectives and research. Journal of the British Interplanetary Society 48, 415-418. 96. Thomas, D. J. and J. P. Schimel. 1991. Mars after the Viking missions: Is life still possible? Icarus 91, 199-206. 97. Warren, P. H. 1987. Mars regolith versus SNC meteorites: Possible evidence for abundant crustal carbonates. Icarus 70, 153-161. 98. Zent, A. P. and C. P. McKay. 1994. The chemical reactivity of the Martian soil and implications for future missions. Icarus 108, 146-157. 99. Zent, A. P. and R. C. Quinn. 1995. Simultaneous adsorption of carbon dioxide and water under Mars-like conditions and application to the evolution of the Martian climate. Journal of Geophysical Research 100, 5341-5349. 100. Zent, A. P., F. P. Fanale and S. E. Postawko. 1987. Carbon dioxide: Adsorption on palagonite and partitioning in the Martian regolith. Icarus 71, 241-249. 101. Zubrin, R. 1995. The economic viability of Mars colonisation. Journal of the British Interplanetary Society 48, 407-414. 102. Zubrin, R. M. and C. P. McKay. 1993. Technological requirements for terraforming Mars. AIAA 93-2005. 1-14, 29th Joint Propulsion Conference and Exhibit.